There was no shelter for the Webb’s AC lads fishing at Float Fish Farm Fishery on Sunday. The up and coming venue may only be a couple of minutes from Stanground, but the wind still swept across the water as if you were fishing in the middle of the fens. Winner George Bates put a very respectable 36lb 5oz to the scales from the Two Island Pool, all caught on the pole with pellet. Harry Murphy came in second with 11lb 6oz, followed by Alan Forrest with 7lb 11oz. Top rod in the Decoy Beastie Lake match on Tuesday was Chris Barley. The Dynamite Baits-backed rod drew peg 24 and put a fine 93lb 10oz to the scales. Nigel Baxter took second place with 78lb 2oz. followed by Ray Pauley on 73lb 3oz. Saturday’s Decoy Open, again on the Beastie Pool, saw Tony McGregor win from peg 22 with 74lb 3oz. Then came Pete Lamdin on 73lb 8oz and Tony Evans with 73lb. 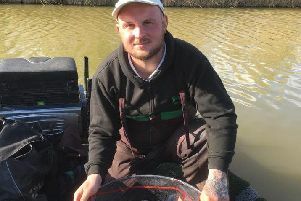 City rod Dale Stones made his mark in the Oakham AC match fished at Lakeview. He topped a strong field with 68lb 9oz of carp all taken on the pole with sweetcorn. Rutlander Bob Burton took the runner-up spot fishing maggot, finishing on 51lb 12oz, followed by another local, Ian Bullimore, with 48lb 10oz. I always get a feeling summer can’t be too far away when the Buttonhole Tuesday evening matches start. So I was pleased to hear this popular series started again this week and will run every Tuesday under floodlights. Fishing is from 5pm until 9pm. Contact fishery owner Richard Button for all the details on 01945 430629.